The meeting of the ILS Operations & Technology Policy joint committee scheduled for September 27, 2018, has been rescheduled to October 18 due to lack of a quorum. The materials for the meeting are posted on the committee page. With the new school year beginning its time for a Pull List Reminder. Doing the pull list regularly is of vital importance to ensuring the continued resource sharing of the region. Do your pull list at least once before each delivery pickup. Do Not Delete Requests for other Libraries Patrons. Mark items missing if you cannot find them. Contact the borrower’s home library. You must hit list pulled once you’ve printed/pulled the list. The items are bound to your location no matter what, but hitting the list pulled button lets us know someone looked at your list that day. You are expected to do your pull list at least once before each delivery pickup. In other words if you get delivery 3 times a week you should do you pull list at least 3 days a week. If you get delivery 5 times a week, then you should do your pull list at least 5 days a week. It’s preferable that your pull list is done every day, one for habit, but also because patrons can see the status of their request (in transit is more welcoming than simply requested). Do Not Delete Requests for other Libraries Patrons. Requests will move on to another available item if the item is marked missing or checked out. If you cannot find the requested item, mark it missing. Otherwise the item will keep showing up on your list as it’s bound to you. You are expected to contact the borrower’s home library If you have the only circulating copy of a requested item and you have to mark it missing. Then that library can order through MNLINK or talk to their patron. We do check to see who is not running their pull list. And I have sent out not-so-gentle-reminders to people. I dislike sending those as much as staff dislike receiving them, so please do your pull lists so I don’t have to send those out. Thanks everyone and please send questions to the SELCO Help Desk. 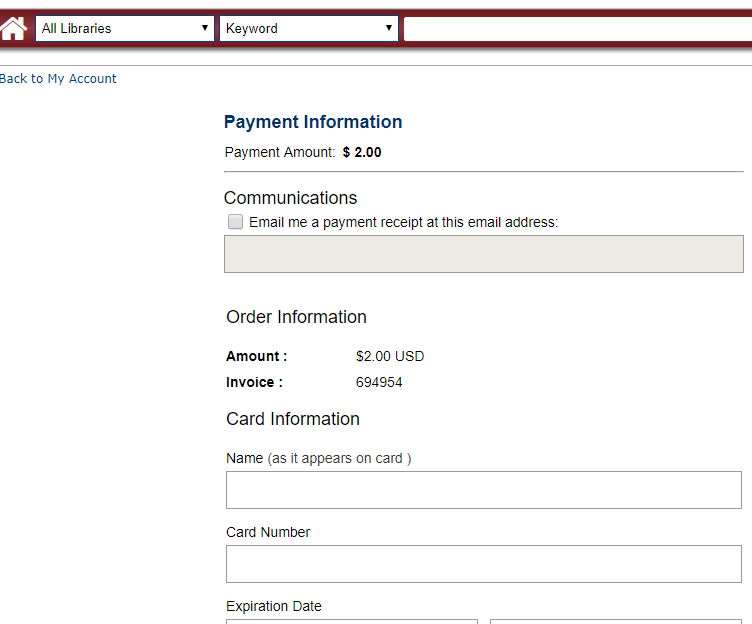 As was previously reported, online fee payments through PayPal have not been writing to the Horizon database since June. SELCO has been investigating methods to repair the situation and has arrived at a solution. On Monday, August 27, we will be turning on BLUEcloud Commerce as a replacement to PayPal. This is a product supplied by our Horizon/Enterprise vendor SirsiDynix so it integrates well between them. There is a minimum $1 payment before fees can be paid in order to ensure merchant fees are covered. Borrowers no longer leave the catalog when paying fines. The functionality is built in and they can quickly return to My Account (image below). From our testing, everything else will work like PayPal. Credit card payments will log to the location matching the Enterprise profile the borrower logged into initially. If you use Adhoc reports, this may affect those but the Web Reporter ones should still function normally. SELCO will continue to disperse the funds as we have under PayPal. If you or your borrowers encounter difficulties with the new product, please let the Help Desk (helpdesk@selco.info) know immediately. Thank you for your patience as we have dealt with this unexpected situation. The exciting new partnership between SELCO and Rochester Public Library allows patrons to access digital materials from each of the 2 separate collections. SELCO patrons can learn more about how to access eBooks from RPL’s collection in these very brief videos on SELCOtv. Instructions for using Libby are located here, and using OverDrive from the SELCO Online Catalog are here. For detailed instructions on downloading, installing, and using Libby to access the digital collections, see this handy brochure produced by Rochester Public Library and edited for SELCO patrons. 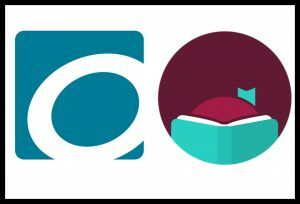 SELCO (Southeastern Libraries Cooperating) and Rochester Public Library (RPL) are teaming up to offer more digital titles to southeast Minnesota residents. Under the OverDrive RLA (Reciprocal Lending Agreement), library cardholders have greater access to eBooks and audiobooks, in each organization’s OverDrive digital collection. The agreement allows the regional library system and the Rochester library to offer digital books similarly to the way the two organizations share physical materials. The RLA agreement was approved in late spring by the governing boards of both RPL and SELCO, and the two organizations launched the new service at the end of June. The popularity of Libby, a digital reading app, has, in part, led to an increase in circulation for digital titles. At RPL, the circulation of digital materials increased 8.5% in 2017 with over 550,000 digital downloads from OverDrive and other digital services. At SELCO, users accessed 175,000 titles in 2017, an increase of 4.6% over the previous calendar year. For more information about the expanded services, patrons can visit each organization’s website: SELCO at www.selco.info or www.rochesterpubliclibrary.org. Due to a change made by PayPal to their software, fine payments made in Enterprise are not being recorded in Horizon. Pending a fix from SirsiDynix, we have developed a manual workaround to ensure that Horizon correctly reflects the payments made in Enterprise, albeit after a delay of a few hours. It has come to our attention that PayPal has made some changes to their software that break the link between Enterprise and Horizon. 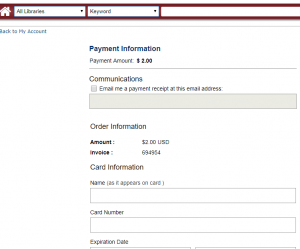 Fine payments in Enterprise are properly recorded and collected by PayPal but Horizon is not updated. This means that fines paid for in Enterprise are still in the Horizon borrower record as blocks despite being paid. All payments made in Enterprise and affected by this issue have been manually added to Horizon borrower records. We have a script in place that ensures the payment data is recorded in the database as an electronic payment from Enterprise, rather than as a manual payment entered by staff. Until this issue is resolved, SELCO staff will continue manually entering payments that come in via Enterprise. We are doing this four times a day and will keep it up over the weekend. Under the circumstances, there may be a delay of several hours between the time a payment is made in Enterprise and when we get it added to Horizon. We have placed a warning message in Enterprise to let patrons know about this delay. The script that changes the recording of the payment from manual staff entry to electronic payment is running once nightly. Therefore, money reports will accurately reflect the mix of payment types the day after payments were made. The script is automated and will run over the weekend. The fix for this issue is an upgrade to Enterprise that will accommodate the changes made by PayPal. We have placed a request with SirsiDynix and are attempting to get it prioritized in light of the circumstances. There are several other sites (including some using Symphony) similarly affected, however, and we have not yet gotten a response from SirsiDynix on our request. We will post more information as it comes out. Please don’t hesitate to reach out to me with any questions. Kudos to LaVonne Beach (LaCrescent PL), who first spotted this issue. Also to Sara Berquam and Tyler Irvin (SELCO) who did most of the work developing our manual workaround. SELCO and Rochester Public Library (RPL) are partnering to survey patrons that have used OverDrive. The first survey, which launched yesterday (Thursday) afternoon, gathers baseline data on use of the platform. A second brief survey will be sent as a follow up in approximately one month; we will post further information on that survey before it goes out. Patrons who have used OverDrive were sent the survey via email. We are pleased to report that we have had almost 450 responses as of 8:15 am this morning (Friday). In planning this survey, we did not anticipate requiring any action from Online Libraries. We have since learned, however, that the design of the survey has caused some unexpected issues. You may receive calls today from patrons wanting to know if this survey is legit. We apologize for any inconvenience this causes your staff and patrons. Several of you have offered suggestions for improving the survey. Thank you! We will incorporate.those suggestions, and any others we might receive, into the second survey.